This post is part of the weekly series Friday Finds featuring news that you may find both valuable and interesting. The topics that I’ll be focusing on this week include link building, tips on converting website visitors, social media and tips on CSS style sheets. Sometimes the best way to learn about something is by reading an article that lists what not to do. Lots of bloggers talk about the importance of link building. In this article by Michael Garrity for Website Magazine, he advises his readers to avoid eight common link building mistakes ranging from tips about content, commenting, social media, buying links, submitting to directories, over-linking to your own site and the use of anchor text. Sometimes, we put too much focus on website traffic and not enough focus on conversions. Whether we’re looking for buyers, clients or subscribers, our focus should be on the bottom line. In this article, Daniel Sharkov shares eight tips on how to get better conversion rates by tweaking your WordPress blog. With over 1,950 tweets as I’m writing this, there’s a good chance you may have already read this article but it’s definitely worth sharing here. This guest post by Bryden McGrath on SocialMediaExaminer.com provides some great tips on how to encourage people to interact with you using social media. The screenshots that he includes highlight examples from companies such as Whole Foods Market, The New York Times, the Travel Channel and NBC News. You’re bound to pick up an idea or two from reading this. CSS stands for cascading style sheets and basically it’s a document that defines the design element of your website/blog. (Many of you may not remember the old days of having to code the design elements into each page of what was referred to then as “static” HTML websites. It was a boring and tedious task.) Every WordPress theme includes a CSS style sheet. Making some simple styling changes can be intimidating. If you’d like to expand your CSS knowledge, check out this post. I found the link that he included to explain the CSS box model to be especially helpful. My favorite of these all is the one for link building especially that my site is fairly new. I have yet to create Facebook account so maybe I have to read the one about social media management, too. Very helpful with the good list of articles! The most interesting piece for this week on digital marketing would be Google make the announcement that Penguin 2.0 will be out very soon. Surely it will be an interesting movement again in the industry. 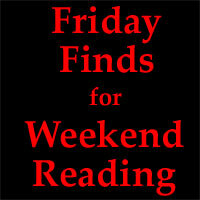 Hey Sherryl, I look forward to your Friday Finds every week to catch up with my reading. I am sorry to learn that maybe next week I might not get to hear from you. But I would be waiting for you to return and carry on with whatever you were doing. Thanks for informing us about your absence. Hi Sherryl, nice list of articles. The point in the ink building no-no’s article regarding building links to internal pages as well as the home page is very useful. I have a bunch of sites where I am targeting a main keyword or two on the home page, but where I get a ton of traffic from internal pages that are targeting related keywords. Quite often these keywords have much lower competition and as a result require only a handful of links together with quality content to rank well and bring in traffic. Thanks for sharing Sherryl, I loved the post about linkbuilding no no’s. Linkbuilding is such a hot topic right now and except for the Head Google (Matt Cutts?) team members I wonder if any of us know what we’re doing. Thanks for sharing. Hi Sherryl, I have found your article ” Friday finds” very interesting. Its very nice to find multiple useful articles at a uni place. I have already read one of those ” 8 Effective ways to increase your blog’s conversion rates”, it was very useful to every blogger. will definitely read other entries too. Hey Sherryl, thanks a lot for sharing these links. I read them over the weekend, and I found them really useful. I have come to know a lot from your posts, my knowledge seems to have increased considerably. Thank you once again,hope you keep up the good work. Hi Sherryl, I am thinking of reading – 7 ways to improve your social media engagement. One of my friends recently pointed out to me that I need o work on my social networking. Lets see if this post can help me, thanks a lot for sharing. I think you’ll find that article helpful. SocialMediaExaminer.com is a great resource for all things social. Thanks for taking the time to let me know that you’re going to check it out. I did not have a lot of time this weekend, had to rush to office because of some urgent work. I wasn’t able to take out time to go through these sites. However, will try to do this in this week itself. Anyways thanks a lot for sharing Sherryl. You’re welcome James. I hope you find some valuable information in the articles that I shared this week. Sherryl Perry recently posted..How Many Social Networking Sites Should You Join? I have had a chance to check out a couple of these links and I am loving your post. I am new to the blogging world and am learning so much. THANK YOU. Elizabeth Scott recently posted..What is Triberr? Catarina Alexon recently posted..Want to turn your phone into a robot? Concentrating on your country sounds like a good idea for you Catarina. Maybe you could start a community on Google+ and promote it on your blog. Hello Sherryl, Building a stable readership is something we all need to focus on because it’s what makes a blog a blog. If you have a reasonable amount of readers the rest will follow. For those starting out they don’t really understand how things work and focus on Tricia more then anything. Thanks so much for the great share my friend have a wonderful day. Thanks for dropping by Rob and taking the time to join the conversation. I appreciate the feedback. I’ve heard from bloggers who really enjoy the comment section here and they find the input from other bloggers to be valueable. This is a great idea Sherryl! I love the article of Bryden McGrath about improving the Social Media engagement. Lots of people check their social media accounts and they keep up on their Facebook inbox more than email. Which means we can create a connection and dialogue with prospects anytime, from anywhere, that can lead to a professional and personal relationship for us and our business. Thanks for letting me know that you like the idea of this series and that you enjoyed Bryden’s article. SocialMediaExaminer.com is a great resource to find articles about social media. I’m glad you found Daniel’s post interesting. I’m enjoying writing this series. I’m always finding great content to tweet about. So, it made sense to highlight some of them weekly. Thanks for dropping by and the good travel wishes too. Some quite interesting and useful articles there. I found some more information on HTML 5 and CSS3 on one of that blog and it was really detailed tutorial which even a newbie could understand. WPKube is a great blog to follow Keral, especially if you want to keep up with the somewhat technical side of bloggin. That was a guest post but Devesh (the blog owner) also has a way of explaining technical jargon in a fairly simple way. Sherryl — excellent reference posts. I’ve been consistently linking to my internal pages since I read this tip elsewhere several months ago. But I hadn’t given much thought to varying the anchor text which I will start doing. Thanks. Susan — I hope you have a Pinterest account, too. Your images would be perfect there. You’re welcome Jeannette. I’m enjoying writing this series. It’s making me pay closer attention to some of the details in the articles when I’m writing the short recaps. I remember the good old days before css style sheets. It was time-consuming and repetitive. I occasionally run a few tests the old way, but not very often. I think css is one of the easier things to learn, and you can do some really nice design tweaks with a little imagination. The only thing I don’t like about it is some browsers (usually internet explorer) don’t recognize certain styling that Firefox and Chrome do. Trying to remember these are another story sometimes. Ray recently posted..How Long Does It Take Google To Show My Authorship Face? I just went to the first two sites and all I can say is WOW. I really did get something out of each one of them. I never really thought about Instagram. I have never really use it even thought I have an account. Hash tags are another thing I know every little about. Time to start learning about this stuff. There is just so much to learn, isn’t there? Instagram is probably a perfect fit for you. That hadn’t even occurred to me but you should have popped into my mind on that one! Previous post: How Many Social Networking Sites Should You Join?